I last posted about my honeybee hives in April, describing with awe the drama of a swarm out of, and then back in to, Buzz. That event morphed into several months of beekeepers’ head-scratching and eventual realization that something wonky happened in Buzz and that our remedies to fix the wonk proved futile. Rest assured that Scar, one of our original (Warre) hives, and Woody, our newer (Langstroth) hive, have enjoyed success this 2017: queens producing plenty of brood and workers creating generous amounts of comb and honey. But it’s been a mixed-bag 2017 for our backyard honeybees. Pollen covered honeybee on Rock rose (Pavonia lasiopetala). At the beginning of spring, Buzz was queen right (meaning that she had a healthy queen), but by April, we saw no brood, which means the queen isn’t laying eggs, which means that the hive is no longer queen right. We requeened Buzz–twice, in fact–but the hive continued broodless, and without brood, there is no new generation of honeybees to carry on the tasks of the hive. One long-time beekeeper suggested that perhaps Buzz had developed laying workers, which happens when a hive is queenless for a period of time. 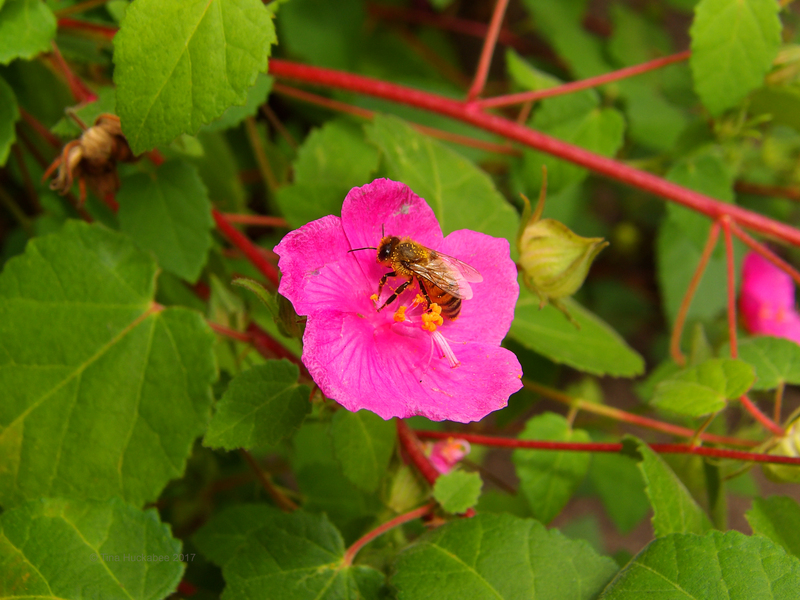 Worker bees can lay eggs, but the eggs aren’t fertilized, so no larvae develop, and when there are no new larvae, there are no new adult bees. Laying workers are a particularly difficult problem in a hive and what I learned indicated that once that situation is in play, there’s little a beekeeper can do–the bees will continue killing any introduced “real” queen, and laying workers don’t produce fertilized brood, so the stage is set for a dying hive. By late June, we accepted that Buzz was done; the gals would live out their lives and the hive would die. It was a sad conclusion, but we did what we could for Buzz in re-queening and were out of options. We went about our summer life and should have checked the hive in late July or early August for any problems, but didn’t: some travel, some stormy weekends, and some laziness all conspired to delay our beekeepers’ responsiblity of checking the hive during that period. In late August, we finally checked Buzz and horror met us: Buzz was crawling with the foul and disgusting adults and larvae of the Wax Moth, Achroia grisella. The comb was riddled with creepy-crawlies, nasty frass, and blackened, mutilated comb. There were only about a dozen bees remaining in Buzz; the lassies had no comb, pollen, or honey stores left undamaged by the moths and their offspring. We were so appalled at the sight that we immediately and completely dismantled the hive, packaging the frames in plastic trash bags for disposal and undertaking a (somewhat) cathartic wax moth/wax moth larvae killing spree. 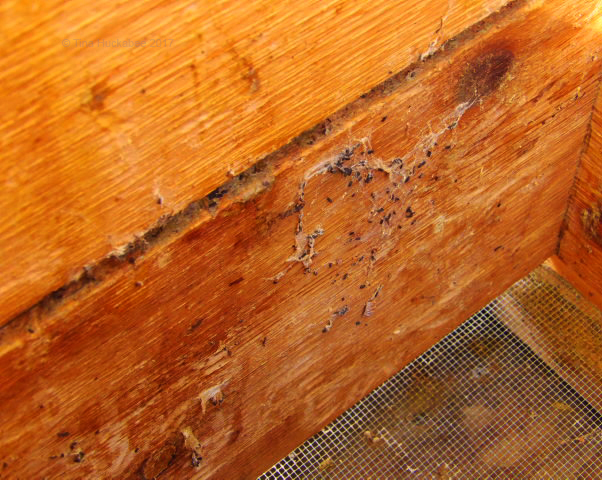 Wax Moths are an invasive insect which do great damage to a hive, but are usually only a problem if the hive is weak. Yup, that pretty much describes Buzz. Poor, poor Buzz. I guess we should have attempted to dump some of Buzz’s honeybees into Woody earlier in the summer, but we didn’t. Up until that last few weeks, we were checking Buzz regularly and while it was clear that there were fewer and fewer bees at each check, Buzz was buzzing. Apparently, the moths moved in during the August checking dearth, and in short order, totally devastated Buzz. We worked intensely to rid the hideous invaders from the hive and there was no time for photos of the mess that became Buzz’s innards. 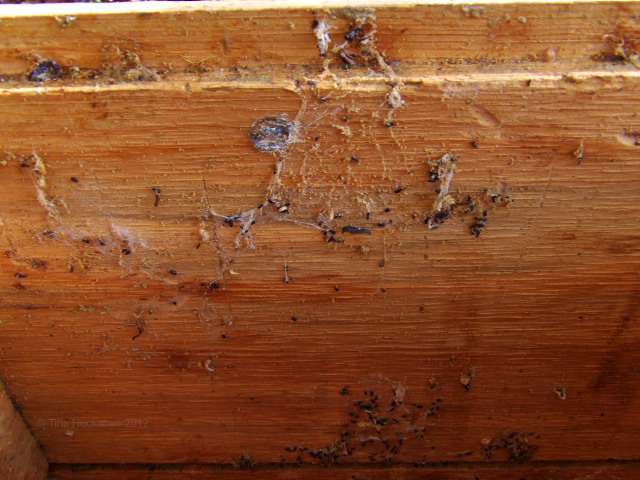 The larvae, moths and resulting hive damage was gross–really gross–so we worked quickly to get the job done. If you want a peek-n-read about this nasty-to-honeybees critter, check out this article from Texas Apiary Inspection Service. Buzz now sits, forlorn and alone. I moved the empty Buzz away from Scar and Woody. I didn’t want Buzz’s cooties near the other two hives. There’s nothing scientific about this, just my weirdness. What’s left is a bit of Wax Moth webbing decorated by larval frass (poop, for the uninitiated). The inside of the hive is downright pristine, compared to what it was when we discovered the wax moths, larvae and resulting damage. I need to clean Buzz (vigorous scrubbing with chlorine, water, and a brush should do the trick), and once that’s done, she’ll be ready to host and house another package of honeybees with a young and healthy queen; that’s on tap for mid-April. As for the other two hives, the news is much better. Scar–who we thought was a queenless hive at the beginning of 2017–not only had a queen but a wildly, massively egg-laying queen! Every time we’ve check Scar, fresh brood and loads honey met with our inspections. 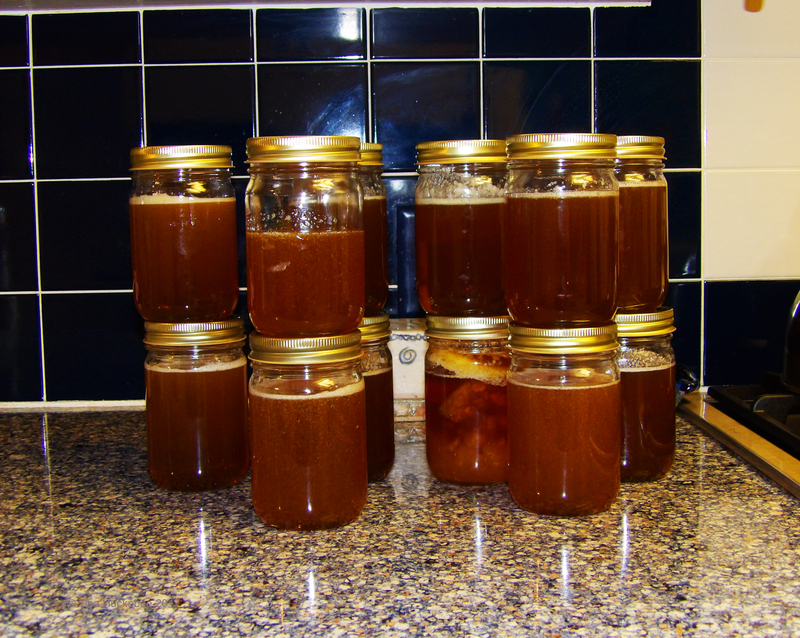 During summer, we took 8 full top-bars of honey, yielding a gallon and a half of honey. Yum! After crushing the comb and dripping the honey into jars, I always set out the crushed comb for the bees’ slurping pleasure. There’s plenty of honey that I can’t get to and I don’t want it wasted. The honeybees should have it as because they’re the heroines of honey. Anything with the goo of honey is fair game to lay out for the bees! The honeybee version of Black Friday! It doesn’t take long for honeybees to strip the comb of any available, edible honey, leaving dry comb which I dump into the compost bin. By late afternoon, the comb is dry, the honey is gone. This year we’ve kept our promise to be vigilant varroa mite inspectors and undertook four varroa checks in all three hives. After shaking a half-cup of guinea-pig honeybees with powdered sugar, we pour them back into their hive, where, due to their sugary coating, they become everyone’s BFFs. Scar won the prize for most varroa mites. Varroa mites are tiny, oval, and red-brown in color. 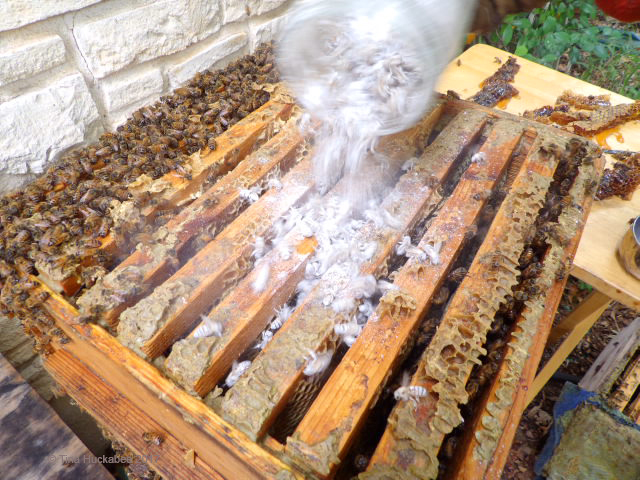 The powdered sugar on the bees, combined with the shaking of the bottle, sloughs off any varroa attached to bees. 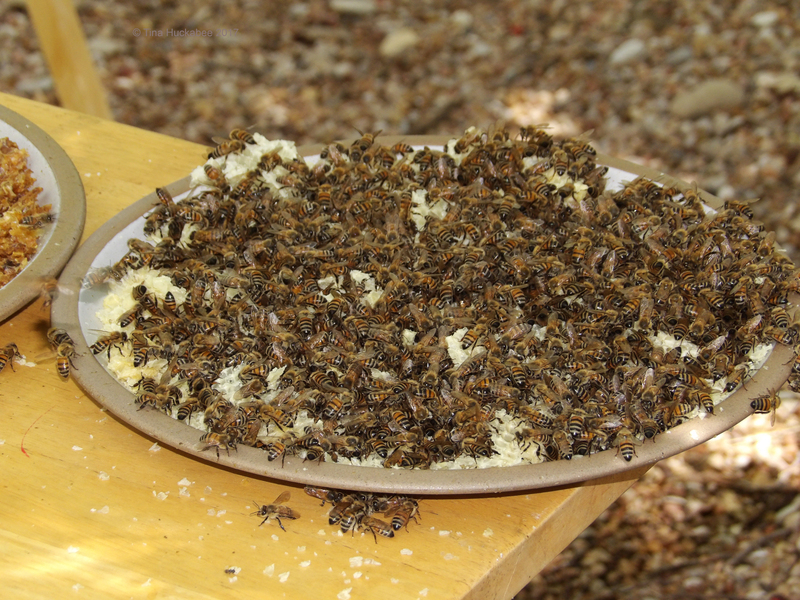 We shake the sugar onto a white plate, spritz with water, and count varroa mites. 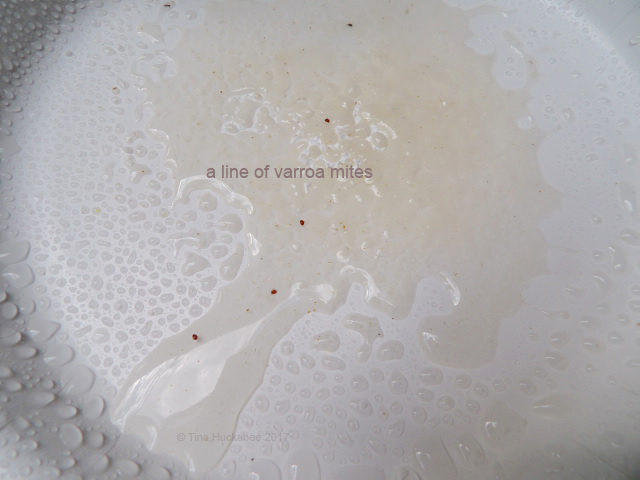 Even so, there were not enough varroa in any hive check (there must be over 3% varroa found per total population of bees–yes, some math is involved here…), to require treatment, which is definitely a win for the honeybees and their keepers. The honeys (and occasional buddies) enjoyed leftover powdered sugar! 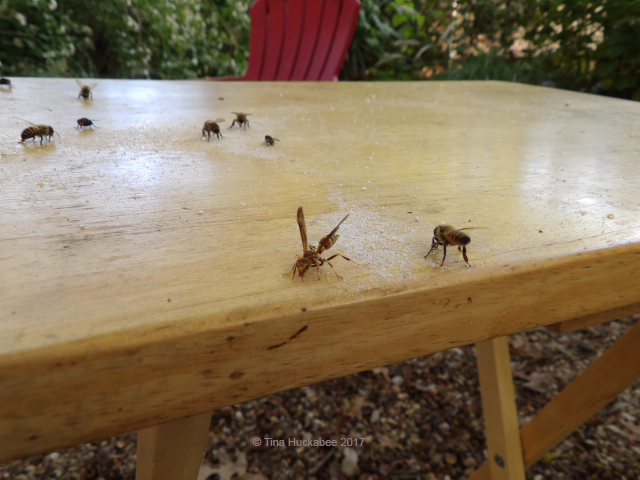 A paper wasp joins with the honeybees in nibbling spilled powdered sugar. The honeybees have had a busy year. What have they done in their spare moments when not tending brood and producing comb and honey? Performance art, of course! 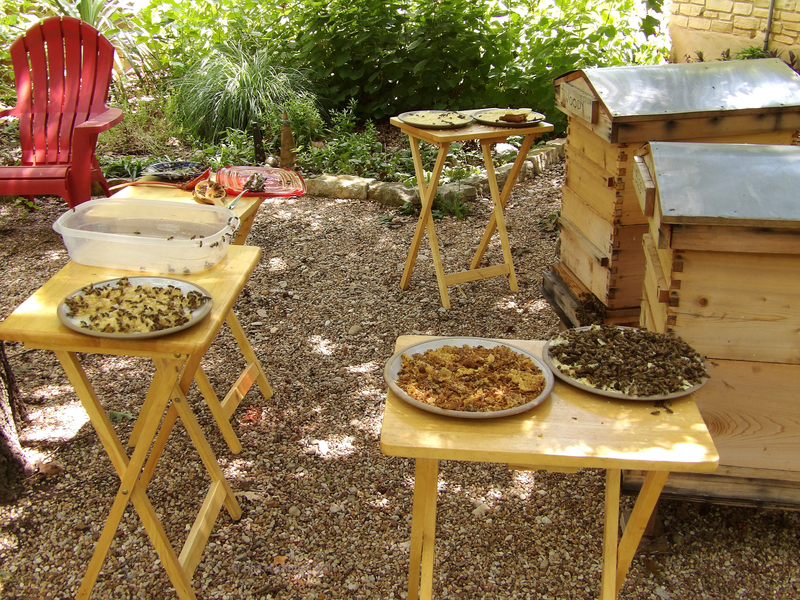 So closes our fourth full year of keeping–and learning about–honeybees. We remain entranced with them, marveling at their work ethic and swooning at their honey. We confess an affection for them (even when we get stung!) and an appreciation for their life cycle and place in our eco-system. Honeybee on a Plateau goldeneye (Viguiera dentata). I’m grateful for their year-round work and partnership with me in the garden. 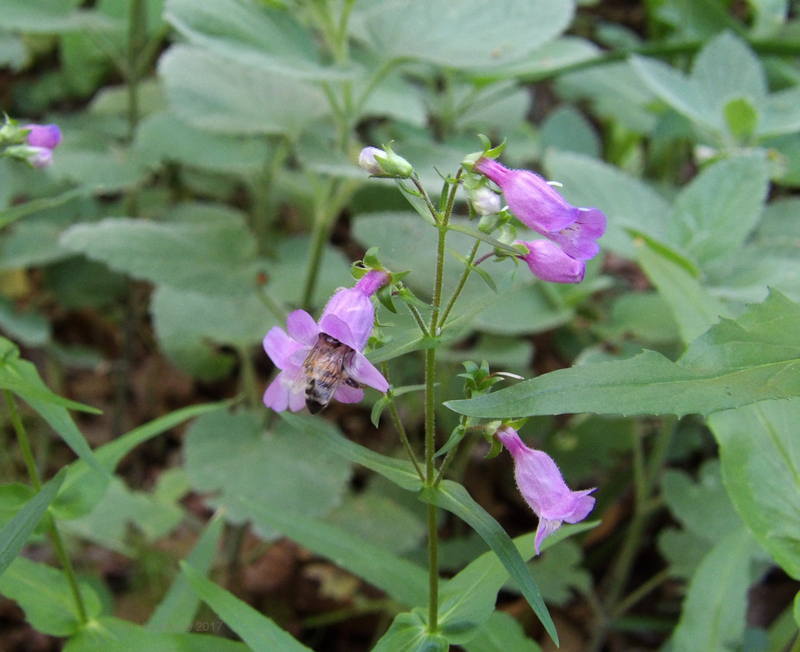 Honeybee on Gulf penstemon (Penstemon tenuis). This entry was posted in Honeybee Hives, Honeybees, Uncategorized and tagged Backyard bee keeping, Biodiversity by Tina. Bookmark the permalink. Fascinating stuff! 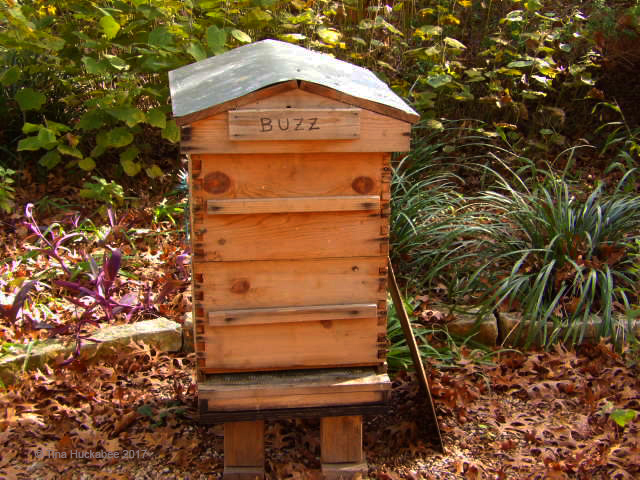 That’s too bad about the Buzz hive–the mess sounds too gruesome for me. But I suppose the joy of the successful hives and the taste of the yummy honey make up for it. Great informative post! I hope 2018 will be a successful beekeeping year for you! Thanks, Beth! It really was gross, those masses of worms, webbing, frass and ick.I’m not sure why we thought the moths wouldn’t take advantage of a dying hive, but somehow…. We’re still learning and each of these experiences will help us in our future bee endeavors. As busy as bees are reputed to be; they seem to keep you even busier. Those buzzy gals do keep us on our toes; there’s always something new to learn. I’m surprised the other hives were not infected. No, the other hives are robust. 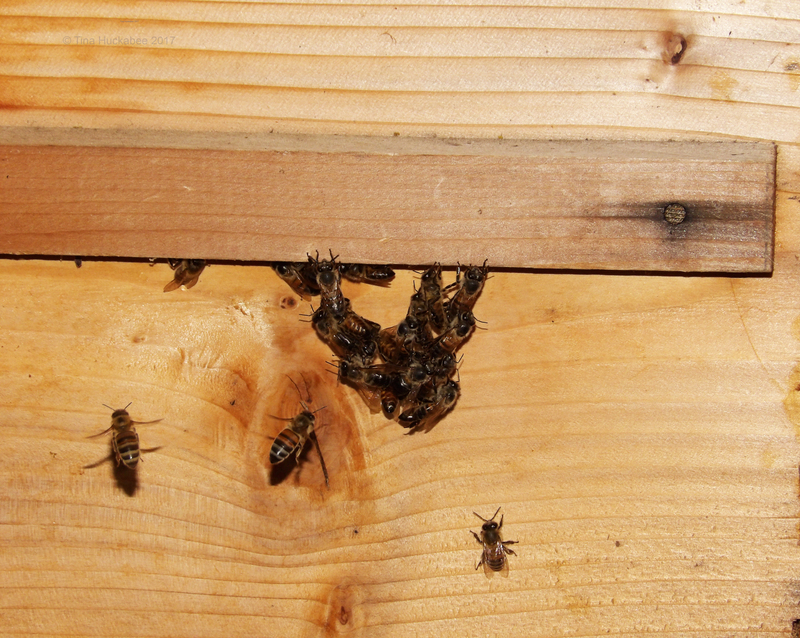 The reason Buzz was targeted was that it was a weak, declining hive–that’s when wax moths can take over. That was really interesting! Thanks for teaching me something today! You’re welcome–glad you enjoyed the read. How heart-breaking for you to watch Buzz failing and then have to deal with the messy end from the wax-moths. I loved your photos of the bee-covered crushed comb though and that honey looks rewarding though. Do you sell it? Well, we set up the situation, so shouldn’t have been surprised–lesson learned! No, I don’t sell it, though I’ve been asked that many times. A jar of local, backyard honey makes a very nice gift, though! It’s quite amazing this honey; those little bees, they know what they’re doing! Tina that pity that by the rebellion of the working bees that ate all their queens, Buzz has ended up in the hands of bugs and the wax moth. The other side of life is that Scary and Woody are robust hives that you can already see in the photos the large amount of honey. I find it curious to see how they sprinkle powdered sugar on the bees to see if they have Varroa mites. And then how those sugar bees enter your hive. Will your partners lick the sugar, will not they? It is marvellous to see the bees in the flowers eating and collecting pollen for their hive. Tina is a magnificent post, with a lot of information and teaching spirit. I have learned a great many things about bees. Thank you very much . I hope that in April Buzz will be full of life again with his Queen and her bees. Happy Advent Greetings from Margarita. It really is a pity, Margarita, but it was a good lesson for us and we look forward to re-hiving Buzz in April. For now, all our other bees are snug in their hives during the chilly weather. Poor Buzz, but these things happen. Wax moth is a problem in the UK as well. I am particularly interested in your sugar solution: there is such conflicting info on whether it is effective or not. I don’t think I have heard of the ‘guinea pig bee’ approach though…. Yup, stuff happens; it’s a good lesson. If we ever face a dying hive again, we’ll dismantle early so as to avoid invasives taking advantage of the bees. As for the guinea-pig bees, they’re just the ones we scoop up and cover with powdered sugar. They are, or should be, representative of what’s going on the the hive as a whole. Theoretically…. I remembered some things from earlier posts — like the powdered sugar trick. 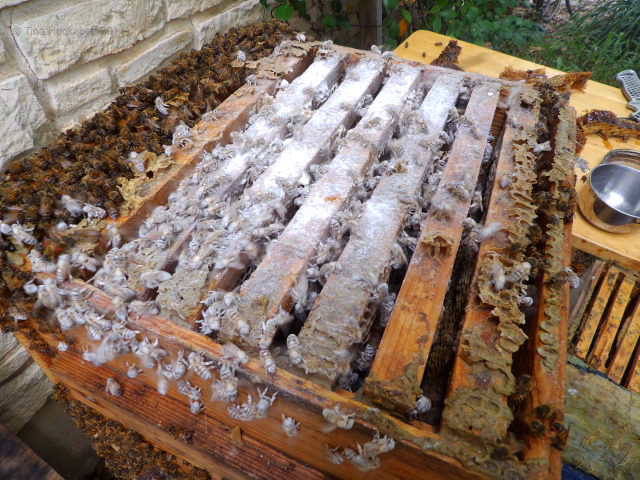 What surprised me was the fact that the bees clean up the honey from the combs. Of course it makes perfect sense that they would; I just never have thought of it. It’s amazing how sensitive a hive is, and how wonderfully complex its workings are. It’s also interesting to read about the similarities between a hive and, say, trees. A strong tree can resist a good bit, from drought to insects. But in a weakened state, it’s easy prey. It’s obvious that’s true for a hive as well. A beekeeper in Virginia that I know had yellow jackets swarm in, and it wasn’t pretty. Bees in tiny jackets! I can just see that and it’s a charming picture. 🙂 However, the tiny wings that keep the hive cool in summer are the same mechanism that keeps the hive warm in winter—built in heaters! 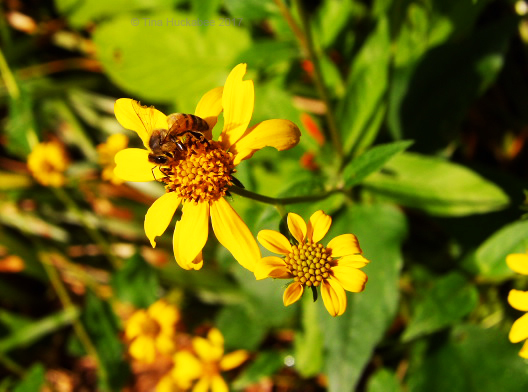 With our recent cool temperatures, the bees have been very quiet and tucked-in. The only concern will be whether they have enough honey stores for winter (they can’t call out for pizza, after all! ), and I’m pretty sure they do. I will concoct some sugar water sometime in late January, as a test, and if they gobble it up, I’ll feed them a maintenance recipe until our first hive check which will probably be in late February/March. The hives hum along, esentially self-managing for the most part, and the bees will thwart invaders–as long as the hive is healthy. But like so many (all?) living things, once it’s weak, it’s vulnerable. And Buzz was vulnerable. I’ve actually seen wax moth larvae before in routine hive checks. I smoosh the larvae, but in a healthy hive, the bees generally do the killing on their own. And I just realized where I’ve seen the word “frass” used. It’s at BugGuide, where photos that aren’t considered worthy of gallery inclusion are consigned to “frass”! Now, that’s funny. Very sorry to hear about Buzz – down with the detestable wax moths! Glad that your two other hives are healthy. Thanks, Jason. Bee keeping is an proposition of mistakes/learn/re-boot/re-learn! I’m happy that the other hives are (so far!) healthy. Fascinating about using powder sugar to weed out the varroa mites. I’d never heard about that – brilliant! Sorry you lost Buzz, but better luck next year! 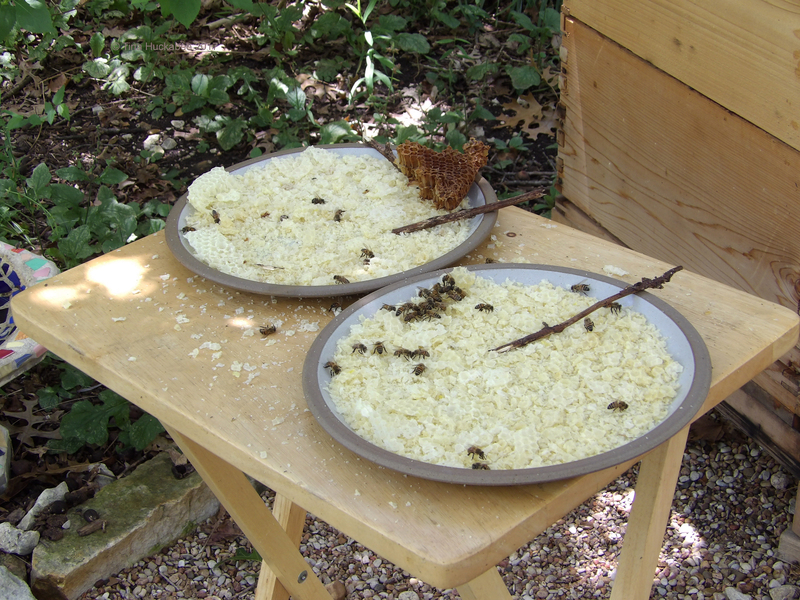 The use of powdered sugar is the go-to for counting varroa mite populations–we learned how to do it by watching YouTube! We have high hopes for new bees in Buzz for late spring.